An international team of scientists, led by researchers at the University of California, San Diego School of Medicine, reports that abnormal sequences of DNA known as rare copy number variants, or CNVs, appear to play a significant role in the risk for early onset bipolar disorder. 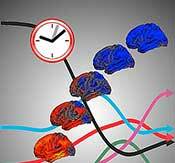 The findings will be published in the December 22 issue of the journal Neuron. CNVs are genomic alterations in which there are too few or too many copies of sections of DNA. Researchers have known that spontaneously occurring (de novo) CNVs – genetic mutations not inherited from parents – significantly increase the risk for some neuropsychiatric conditions, such as schizophrenia or the autism spectrum disorders. But their role was unclear in bipolar disorder, previously known as manic depression. Principal investigator Jonathan Sebat, PhD, assistant professor of psychiatry and cellular and molecular medicine at UC San Diego’s Institute of Genomic Medicine, and colleagues, found that de novo CNVs contribute significant genetic risk in about 5 percent of early onset bipolar disorder, which appears in childhood or early adulthood. The cause or causes of bipolar disorder remain unclear. There is a clear genetic component – the disease runs in families – but previous studies that have focused mainly on common inherited variants have met with limited success in identifying key susceptibility genes. Malhotra said that – while the findings do not conclusively pinpoint a specific gene or genomic region – the new findings show “convincing” evidence that rare copy number mutations strongly contribute to the development of early onset bipolar disorder. He added that sequencing of complete genomes or exomes of large number of bipolar families is needed to determine the total genetic contribution of all forms of de novo mutation to risk for bipolar disorder. Co-authors of the study are Shane McCarthy, Stanley Institute for Cognitive Genomics, Cold Spring Harbor Laboratory; Jacob J. Michaelson, Beyster Center for Genomics of Psychiatric Diseases and UC San Diego Department of Psychiatry; Vladimir Vacic, Department of Computer Science, Columbia University and Stanley Institute for Cognitive Genomics; Katherine E. Burdick, Mount Sinai School of Medicine; Seungtai Yoon, Seaver Autism Center, Mount Sinai School of Medicine; Sven Cichon, Department of Genomics, Life and Brain Center, Institute of Human Genetics, University of Bonn and Institute of Neuroscience and Medicine; Aiden Corvin and Michael Gill, Neuropsychiatric Genetics Research Group, Institute of Molecular Medicine and Department of Psychiatry, Trinity College Dublin; Sydney Gary, Stanley Institute for Cognitive Genomics, Elliot S. Gershon, Department of Psychiatry and Behavioral Neuroscience, University of Chicago; Maria Karayiorgou, Department of Psychiatry, Columbia University; John R. Kelsoe, Department of Psychiatry and Institute for Genomic Medicine, UC San Diego; Olga Krastoshevsky, Verena Krause and Deborah L. Levy, Department of Psychiatry, McLean Hospital; Ellen Leibenluft, Section on Bipolar Spectrum Disorders, Emotion and Development Branch, NIMH; Vladimir Makarov, Seaver Autism Center and Stanley Institute for Cognitive Genomics; Abhishek Bhandari, Beyster Center for Genomics of Psychiatric Diseases, UC San Diego Department of Psychiatry and Stanley Institute for Cognitive Genomics; Anil K. Malhotra, Zucker Hillside Hospital; Francis J. McMahon, Genetic Basis of Moods and Anxiety Disorders, NIMH; Markus M. Nothen, Department of Genomics, Life and Brain Center, Institute of Human Genetics, University of Bonn and German Center for Neurodegenerative Diseases; James B. Potash, Department of Psychiatry, University of Iowa, Marcella Rietschel, Central Institute of Mental Health, University of Heidelberg and Thomas G. Schulze, Department of Psychiatry and Psychotherapy, George-August University, Germany.